Example of post surgical implantation of tag. Acoustic tags are small sound-emitting devices that allow the detection and/or remote tracking of fish in three dimensions for fisheries research. Acoustic telemetry (including acoustic tags) are commonly used to monitor the behavior of fish. Studies can be conducted in lakes, rivers, tributaries, estuaries or at sea. Acoustic tag tracking technology allows researchers to view 3D fish tracks in real-time with sub-meter resolution. Acoustic tags have been employed to help public utility agencies, private firms, and state and federal agencies meet fisheries regulations as defined by the Federal Regulations and Oversight of Energy known as FERC. Acoustic tags come in an assortment of sizes and weights. To-date, the smallest acoustic tag successfully employed to provide fish behavior data in three dimensions was approximately 0.65 grams (tracking a juvenile salmonid at a length of 125 mm). Tag size increases significantly when tracking larger fish for longer periods of time (i.e. sturgeon). 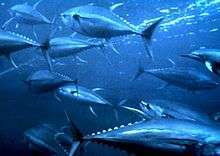 Acoustic Tags transmit a signal made up of acoustic pulses or "pings" that sends location information about the tagged fish to the hydrophone receiver. By tying the received acoustic signature to the known type of programmed signal code, a specific fish is identified. The transmitted signal can propagate up to 1 km (in freshwater). Each "ping" comes at a predetermined interval. The signals are encoded for strength to improve range and resolution. 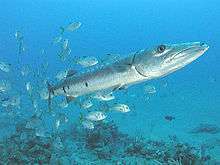 Thus, an array of receivers allows the user to record the movement of a particular fish over many kilometers. Unique to Acoustic Tags is the capability to have over 100,000 user-specified individual tag ID codes with battery lives up to four years. These variables allows a custom fit for unique projects. By determining the sound's time of arrival at each hydrophone, the 3D position of the fish can be calculated. 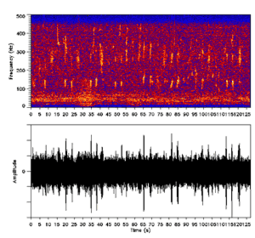 The hydrophone receiver picks up the sound signal and converts it to data that researchers use to plot the resulting tag positions in three dimensions, in real-time. Using a post processing software, such as MarkTags, takes that data and delivers the end result, the 3D track. Acoustic tags can be attached to, gastrically inserted in or surgically implanted into fish (or almost any aquatic life). Several different types of methods are used to attach the tag to the fish. 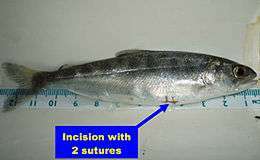 The tag may be embedded in the fish by cutting a small incision in the abdominal cavity of the fish (surgical implantation), or put down the gullet to embed the Acoustic Tag in the stomach (gastric implantation). External attachment using adhesive compounds is typically not used for fish as scale fluids do not allow for any successful attachment to scale tissue. Illustration of juvenile salmonid travelling through a fish by-pass intake. Acoustic tag tracking software screen of fish travelling toward a fish bypass intake (side view). 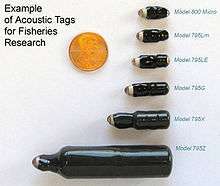 Acoustic Tags are produced in many different shapes and sizes depending on the type of species being studied, or the type of environment in which the study is conducted. Sound parameters such as frequency and modulation method are chosen for optimal detectability, and signal level. For oceanic environments, frequencies less than 100 kHz range are often used, while frequencies of several hundreds of kilohertz are more common in for studies in rivers and lakes. A typical Acoustic Tag consists of a piezoceramic transducer, drive/timing electronics, and a battery power source. Cylindrical or “tube” transducers are often used, which have metalization on the inner and outer walls of the structure. In normal operation, an alternating current (AC) electrical signal generated by the drive/timing electronics is impressed across the two metalization layers. This voltage creates stress in the material, which in turn cause the transducer to emit an acoustic signal or “ping”, which emanates outward from the surface of the tube. An acoustic “ping” can be detected by specialized receivers, and processed using advanced signal processing techniques to determine if a fish swimming into the reception area carries a specific acoustic tag. Acoustic Tags are distinguished from other types of devices such as radio tags, or passive inductive transponder (PIT) tags, in that they can work in either salt or freshwater (RF and PIT tags perform poorly in saltwater) and do not depend on steering the fish in a particular path (PIT tags require the fish to be routed through a restricted sensing area). 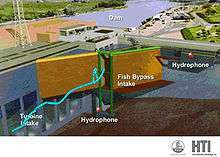 At present, acoustic tags are most commonly used to monitor fish approaching diversion and guidance structures at hydropower dams. This allows hydropowered dam facilities, public utility districts, and municipalities to evaluate specific migration pathways used by the fish (most often salmon smolts), identify where fish mortality occurs and assess fish behavior in relation to hydrodynamic conditions and/or any other environmental parameters. Ultimately, working to improve bypass effectiveness and protect fish populations, Acoustic Tag Tracking Systems are a significant breakthrough in the preservation of migrating salmon populations. For an example of Acoustic Tag Tracking Systems at work on the Columbia River, see Grant County's most recent application or Chelan County's most recent application.